In 1936 The Japanese Railway Government built a new type of steam locomotive to run on the busy mainline routes of Japan. This class of locomotive was desined to replace the earlier class D50 which had become outdated. Earlier units of the D51 where given the nickname of "Slugs" as they had a top speed of 55mph, the class was retired in December 1975. 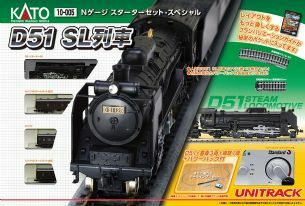 This set includes a Class D51 steam locomotive, Coaches, track and power controller.